Travelling Sophie: Berlin part 4! All vegan! Today, we visited the area of Kreuzberg. Here live a lot of Turkish Berliners. You don’t find that many cool & hip clothing shops here, more larger supermarket’s & Turkish shops. It is a multicultural area. In this area, I wanted to go to a vegan café called Freckles. It is near the lovely Bergmanstrasse. A cool street filled with lovely alternative clothing shops, restaurants & eating-cafés. Vegan eating café Freckles, is located in a side street of this lovely street. Freckles, Nostitzstrasse 33, 10965 Berlin. Very small vegan café but very cosy! When we arrived, there was only was kuchen & vegan desserts on the menu. On their website, they say that they also sell vegan salads, vegan cookies, etc. We didn’t see that on the menu. 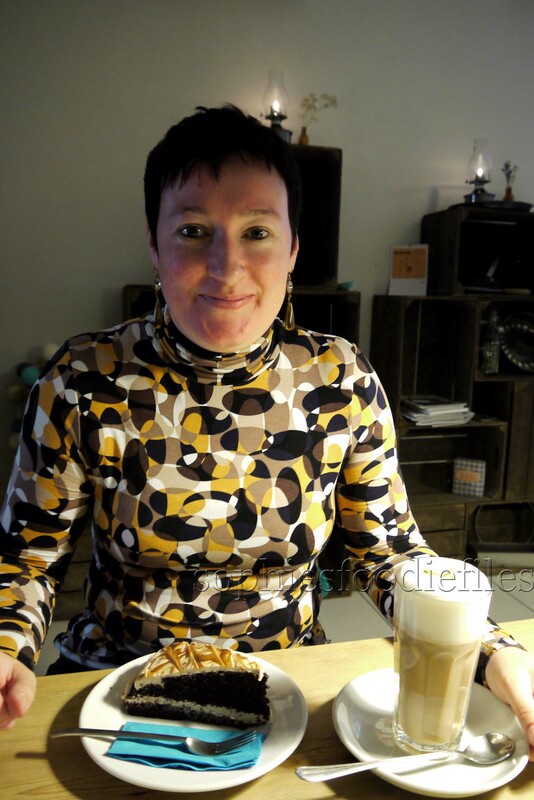 I ordered a Freckles café latte with soymilk & ginger sirup in it: So good, so tasty,…& a big slice of the chocolate cake with lovely soy cream butter layers topped with a speculaas drizzled icing! So freaking delicious! MMMMMMM! You wouldn’t believe it, that butter cream was vegan! 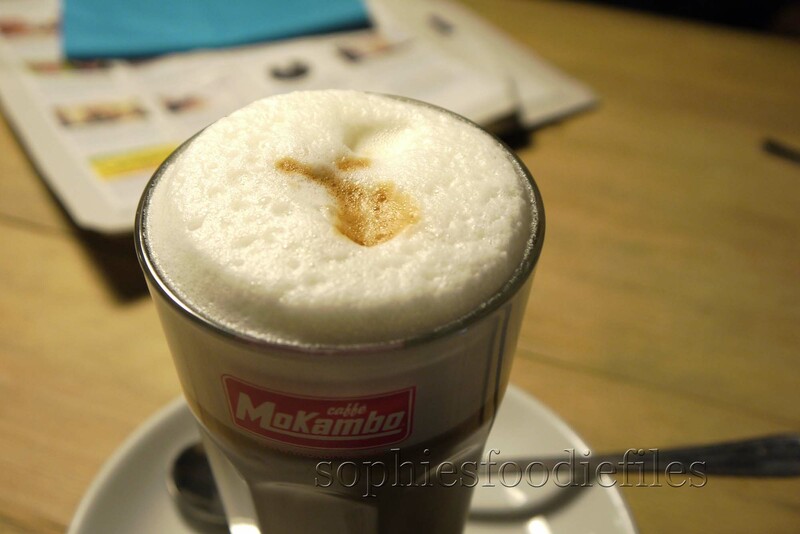 You could choose between several plant-based milks for your café latte’s, like almond milk, soy milk & hazelnut milk. Me being very happy with all the vegan deliciousness! A Freckles café latte with vegan marshmallow sirup! 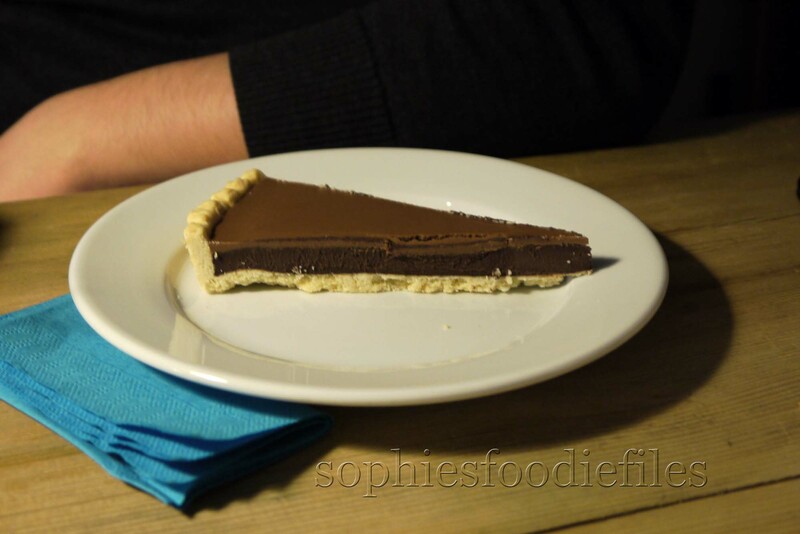 A slice of the vegan chocolate nougat torte, topped with a chocolate ganache! Doesn’t it look very yummy? The 2 Freckles café latte costed each: 3.30€. My chocolate speculaas cake costed me: 3.20€ & Peter’s slice of nougat & chocolate torte costed 3.40€. So in total our bill was: 13.20€. It was so worth it! A few days later, we visited a vegan supermarket & café, called Veganz. I really wanted to go there. We had to take a few U-bahn’s before we arrived there. The nearest U-bahn is: Schönhauser Allee. 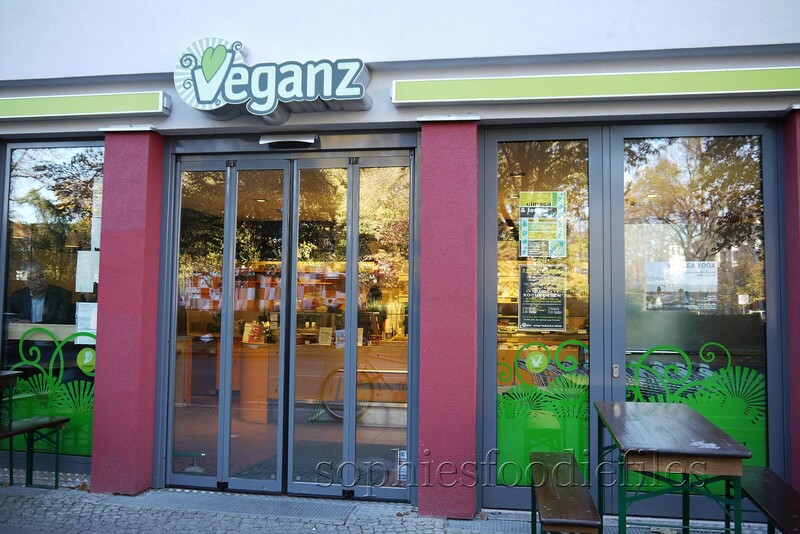 Veganz, Schivelbeiner strasse 34, 10437 Berlin. Open? Supermarket: Monday till Saturday: from 8 AM till 9 PM. Sunday’s closed / Café: Open? Monday till Saturday: from 8 AM till 9 PM. Sunday’s from 9 AM till 6 PM. Yes! I wanted to go there for a very long time & bought a few vegan top products too. ( post + pics later on a separate post!!!! ). It was a smaller vegan supermarket but they had tons of vegan goodies, edible & non-edible, like toothpaste, body milks, etc. They also sold organic veggies & fruits. They also sold dairy-free & vegan advent calendars. How cool is that? 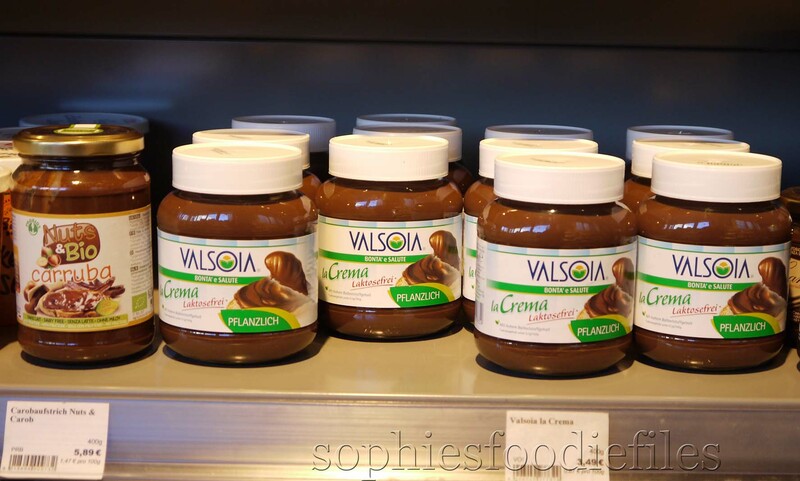 Lactose-free chocolate spreads & carob spreads too, all vegan! All vegan So delicious coconut ice-creams, we don’t get that brand in Belgium! All vegan sausages, in different flavours & tofu & vegan spreads! Yum! All different vegan whipped toppings! 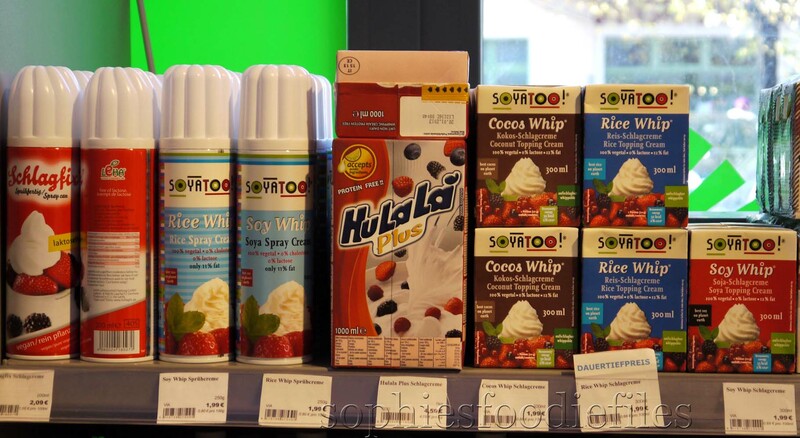 Soy whip, coconut whip & rice whip! 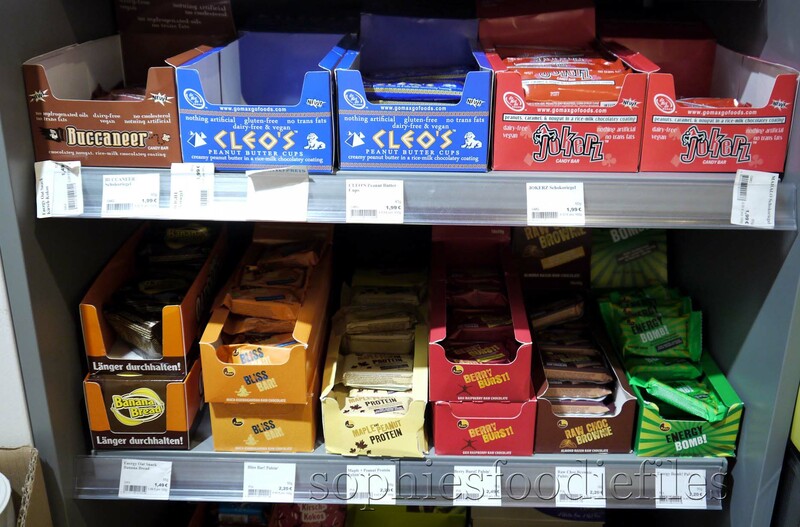 All vegan Vantastic Foods chocolates! Lactose-free, Vegan & Gluten-Free too! 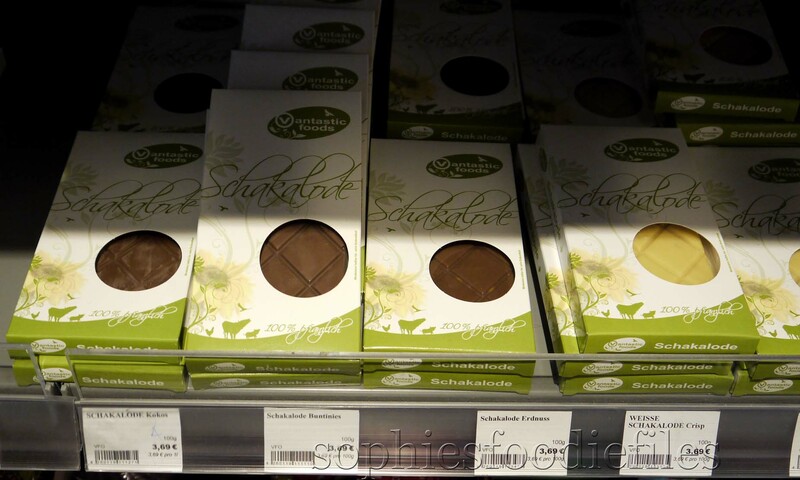 1 bar of 100 gr costed 3.69€! MMM! 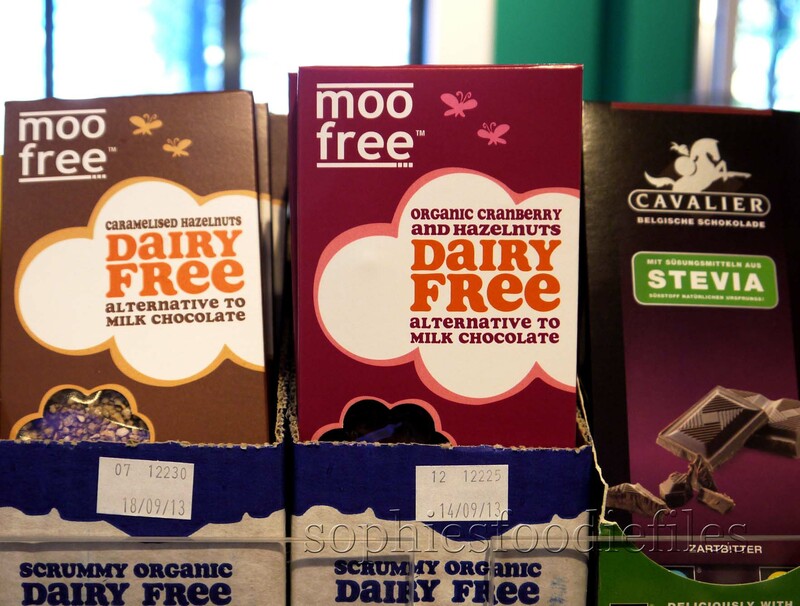 Fantastic vegan chocolate bars : Moo free & Stevia sweetened Belgian chocolate bars! I bought the left chocolate bar! All vegan & some Gluten-Free bars! I bought 2 vegan chocolate chip cookies & they tasted so good! They were a bit crumbly but so amazing! I also bought some other vegan goodies but I will make a post separate from this one, on these vegan edible goodies, after the Berlin-posts! 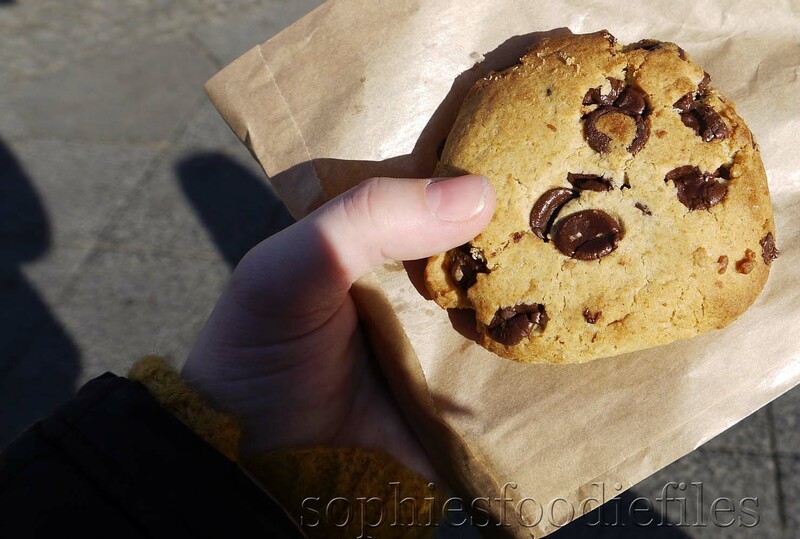 So, I hoped you loved reading my post about Berlin & my culinary escapades. 1. Travelling Sophie: Berlin part 1! 2. Travelling Sophie: Berlin part 2! 3. 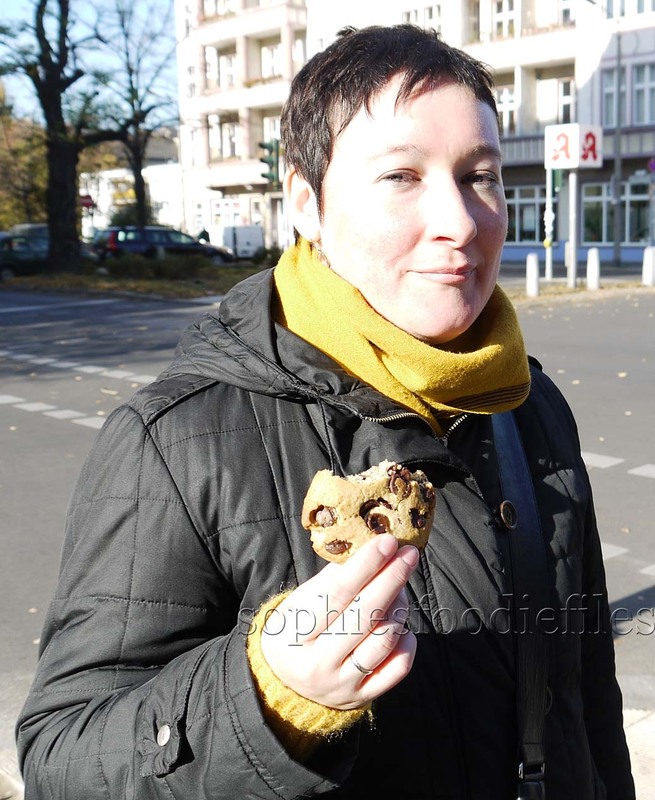 Travelling Sophie: Berlin part 3! Next Post Vegan pumpkin & pumpkin spiced pancakes with home-made pumpkin pie spice! I like your all vegan post! Lots of yummy things! Have a great Saturday! Girl, you did it up RIGHT! Cannot believe all of that vegan goodness! Was it hard going back home :-)? Pleasssee let me come with you to these places!! That vegan cake gave me goosebumps! YUM! Enjoying reading your holiday posts Sophie. Love the photo of you with all the vegan deliciousness! You look like the cat who got the cream. That chocolate chip cookie looks pretty fine too. hahahahhahha! Thanks, saskia! 🙂 It was all so heavenly! What a treasure you’ve found! Sophie, are you completely vegan now? Wow, those are some sinful looking vegan desserts. Who would ever guess they were vegan? Yum! 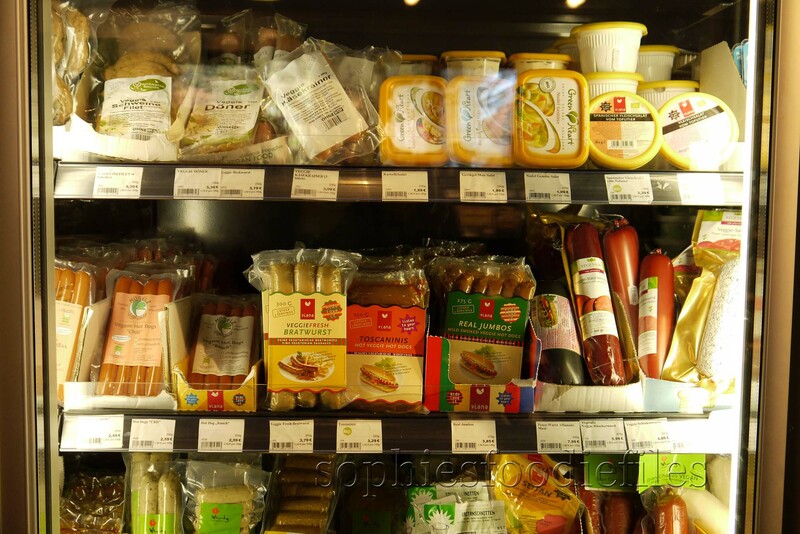 Yep, it is a great & cool vegan supermarket!! You can’t imagine this in Belgium! Thanks, my friend! 🙂 It was awesome! A real vegan store! You can’t even dream of that in Belgium! There sure were a delightful array of vegan items at Veganz café & supermarket, you must be like a kid in a candy store. 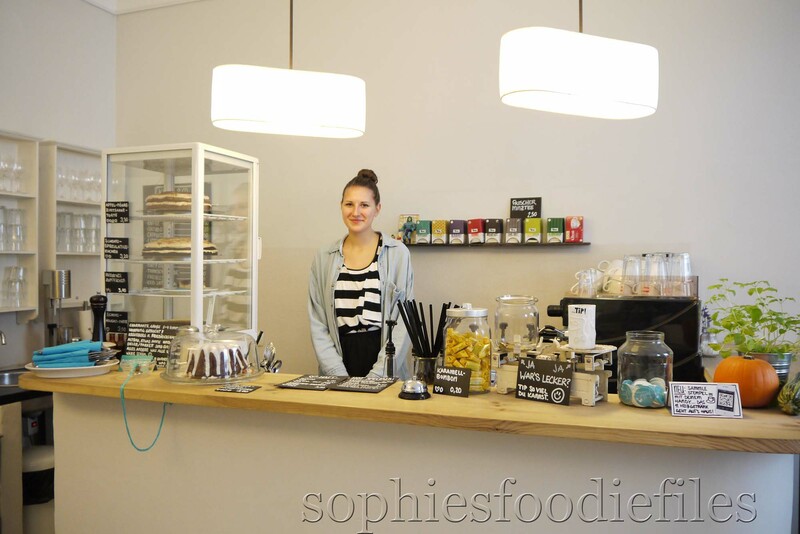 Sophie, take me to Freckles for a slice of that vegan cake….I think I am drooooooooling, it looks sooo yummy!!!! Vegan advent calendars? I need one of those!!! Never seen one here! I don’t live there. It is 500 km away from my home! :(!!! What a selection of vegan foods! Just 2 cookies? I need MORE! I also bought other vegan edibles but will post about them later on! Vegan is good for you! “vegan deliciousness!” i love that phrase! what great travels and food! Hahhahahahha:) thanks, Valentina! I am happy that you enjoyed my travels! Ohhhh, so much amazing food and Freckles has to be the most adorable name for a cafe ever! 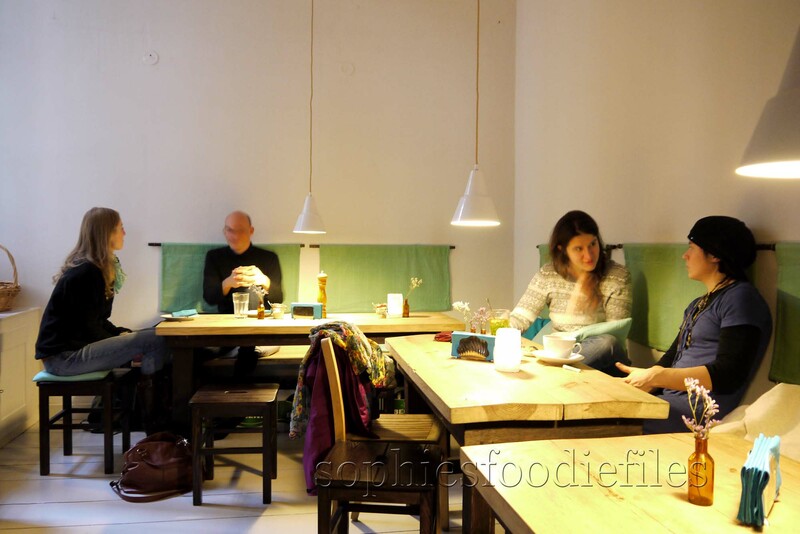 Yes, it is a vegan heaven: Berlin! I never thought that you have so many vegan choices…great! We don’t have that here in Belgium. 😦 Sigh! It is 500 km away! Sophie, a couple of years ago, I decided for one week, I would go completely vegan-just for the experience. What I discovered that just 100% vegan is too difficult and not easy to manage. However, with vegan foods are incorporated into an otherwise healthy diet, it is very beneficial. I have done that too. But my hubby didn’t agree with me! It is hard to go vegan all the way: You can never again eat lovely cheeses, eggs, etc! I wish we had a vegan restaurant like that here! I’d love some dairy free options for dessert! 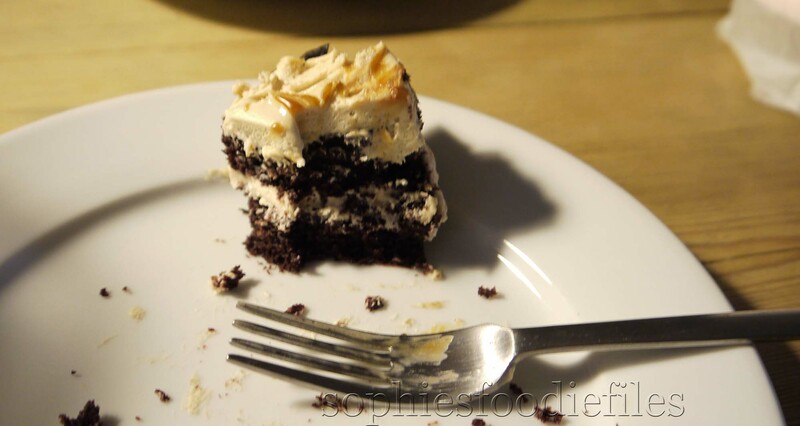 If you want, I make a lot of vegan desserts on my blog, categorized under vegan! Check them out, my friend! I am lactose-intolerant & that’s why vegan desserts interest me enormously!